Portable 1 to 4 person economy Honey Buckets provides you with the core essentials in an emergency, such as: First aid, food, water and sanitation supplies conveniently packed in a 5 gallon honey bucket. 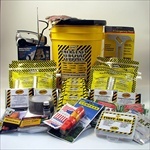 2 Person Emergency Honey Bucket Kit. This kit is great for home, work or auto! This survival kit was designed using advice from experts in the emergency preparedness industry. It follows guidelines given by government agencies and non-profit preparedness organizations. 3 Person Emergency Honey Bucket Kit. This kit is great for home, work or auto! This survival kit was designed using advice from experts in the emergency preparedness industry. It follows guidelines given by government agencies and non-profit preparedness organizations. 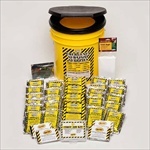 1 Person Deluxe Emergency Honey Bucket Kit. This kit is great for home, work or auto! This survival kit was designed using advice from experts in the emergency preparedness industry. It follows guidelines given by government agencies and non-profit preparedness organizations. This survival kit was designed using advice from experts in the emergency preparedness industry. It follows guidelines given by government agencies and non-profit preparedness organizations. This 2-person deluxe office emergency kit has a retail value of $140. 4 Person Deluxe Emergency Honey Bucket Kit. This kit is great for home, work or auto! This survival kit was designed using advice from experts in the emergency preparedness industry. It follows guidelines given by government agencies and non-profit preparedness organizations. This survival kit was designed using advice from experts in the emergency preparedness industry. It follows guidelines given by government agencies and non-profit preparedness organizations. This 4-person deluxe office emergency kit has a retail value of $170.